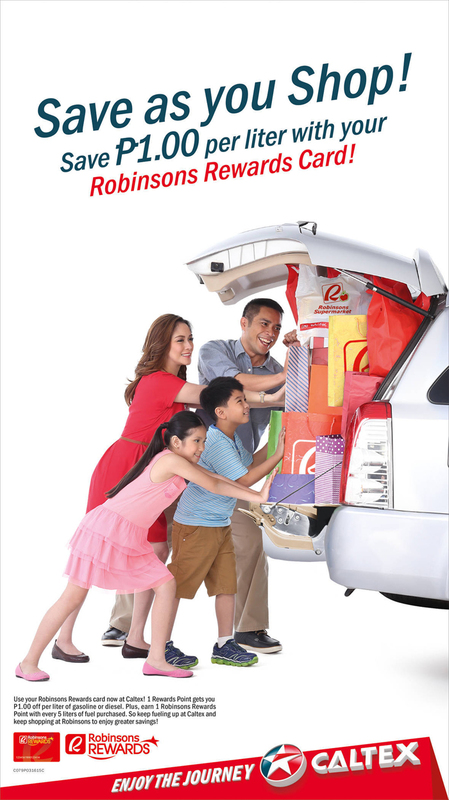 Save As You Shop with Caltex & Robinsons Rewards Card! I am a driver and I honestly can't live without my car (kahit old model) now. Practicality wise, it wins in all aspects. When I used to commute (as a stylist & blogger), I usually spend P1k+ a day riding cabs. Suicide db? During Tuesdays (color coding), I usually book through Uber or Grab-A-Taxi and I still spend quite a sum for my fares. Just the other day, I paid P250 for a trip from Cubao to Makati! That's why if I can, I bring my car nalang because P500 could last me 2-3 days na. Gas prices fluctuates (hate it when it spikes up) but it's better than commuting. As a regular paying gas enthusiast (haha what a term), it makes me happy that even though I spend money on gas, I still get something in return. Thank you Caltex for making your customers feel valuable through your rewards system! Now, here's another reason to choose Caltex--- Chevron, the marketer of Caltex, teamed up with Robinsons Retail Holdings to create a unique offer that allows customers to quickly and continually add value to their purchases by getting a variety of fuel and shopping rewards through their Robinsons Rewards Card! Now, you get quality gas (Caltex with Techron's maximized power, improved fuel economy, lower emission, smoother drive and reliable performance) & enjoy big dicsounts when shopping at Robinsons! You could avail the card for P150 at any Robinsons store. 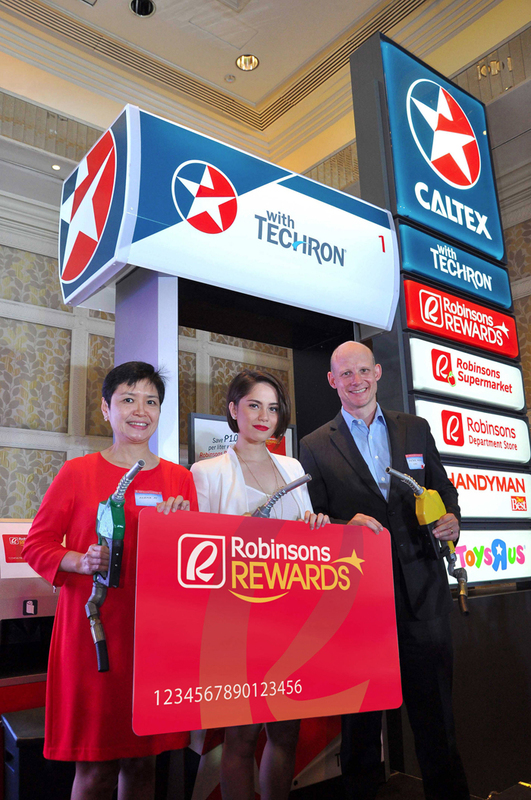 Points earned at participating Caltex stations can be redeemed at any of 1,180 Robinsons stores nationwide including Robinsons Department Store, Robinsons Supermarket, Robinsons Selections, Robinsons Easymart, Robinsons Appliances, Handyman, True Value, AM Builders’ Depot, Toys “R” Us, Daiso Japan, Topshop, Topman, Dorothy Perkins, Miss Selfridge, Burton Menswear, Warehouse, River Island, Shana, G2000, Shiseido and Benefit. Here are photos from the launch! Jessy Mendiola announcing the raffle winners! new gas girls at your service. hehe! But here's a more exciting news! HappyPlus card holders might be wondering what will happen to them with this new partnership. Don't fret! Happyplus will run alongside the Robinsons Rewards Card loyalty program and customers can choose which of the rewards program they want to use. I myself is a HappyPlus card user and I still use it when gassing up! Yipee.